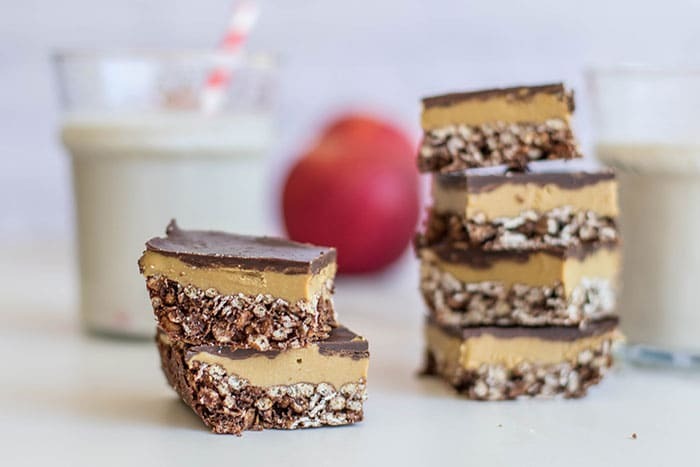 These Chocolate Sunflower Butter Bars are a great treat for school lunch boxes! 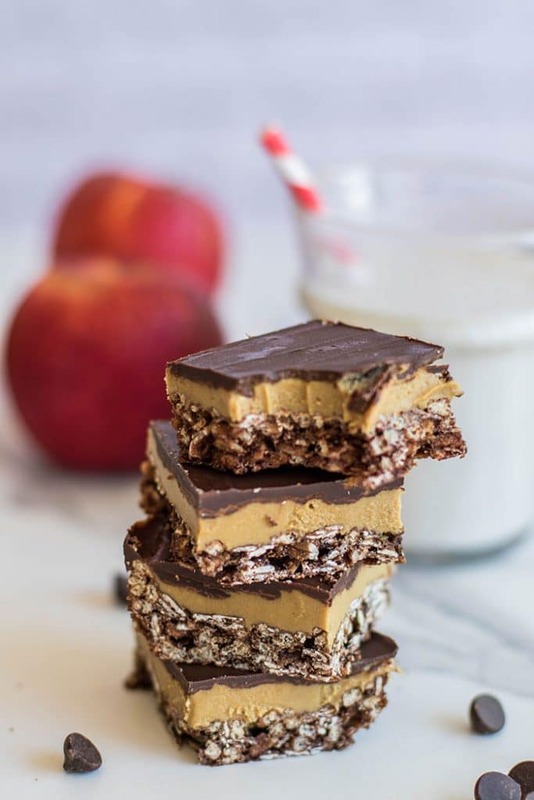 Made with allergy-friendly sunflower butter layered onto a chocolate granola bar and coated with a layer of chocolate — these are sure to be a hit with everyone! This is the second of my LIFE that I haven’t had to go back to school in September. I was in college and graduate school for 6 years after finishing high school, and then became a teacher! I do feel a bit nostalgic that I am missing out on some of the excitement of going back to school, starting a new year fresh, meeting new friends and starting new routines. It will only be a few short years before I have a whole new reason to celebrate “back to school” season. My tiny one turned two recently. He’s now my #1 cookie recipe tester. Xander gives these bars two thumbs up. He sure knows where to find the good stuff (mommy’s photography table). Last year, I published a recipe for Irresistible Chewy Granola Bar Cookies around this time. They are also nut free, and a perfect healthy snack to send with your child to school. 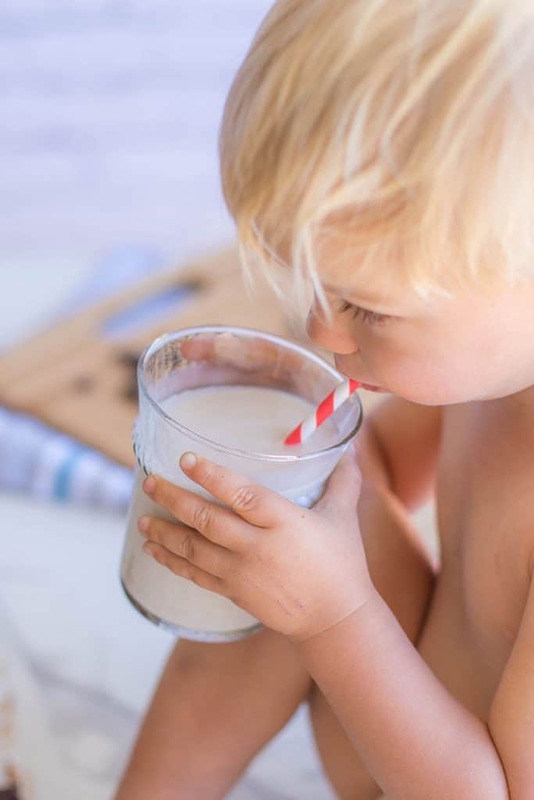 That post also has a discussion about food allergies in children, my own experience, and things to think about to be sensitive to this very serious health issue that affects so many children in America. Other good nut free options from my archives to fill your child’s lunch box? Try these Crispy Date Caramel Bars, or my favorite grab-and-go breakfast, my Toasted Coconut Protein Bars. 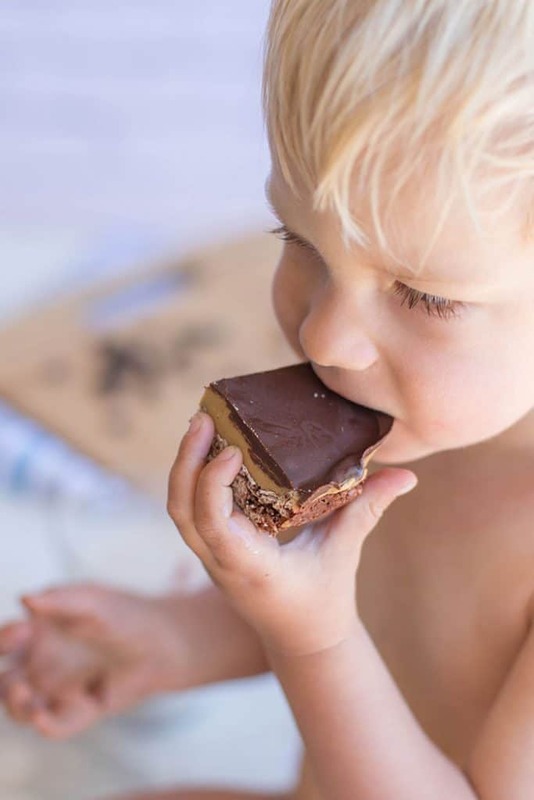 A lunchbox isn’t complete without a treat, and I love knowing my homemade treats are low in sugar, free of refined sugar, and filled with nutritious, whole-food ingredients. Make is Gluten Free: All of my oatmeal baked goods recipes can be made gluten free by using Certified Gluten Free Oats. Brown rice cereal is always gluten free (that I have seen, at least!). Rice crispies do have gluten, so avoid using that as a sub if you need these bars to be strictly gluten free. 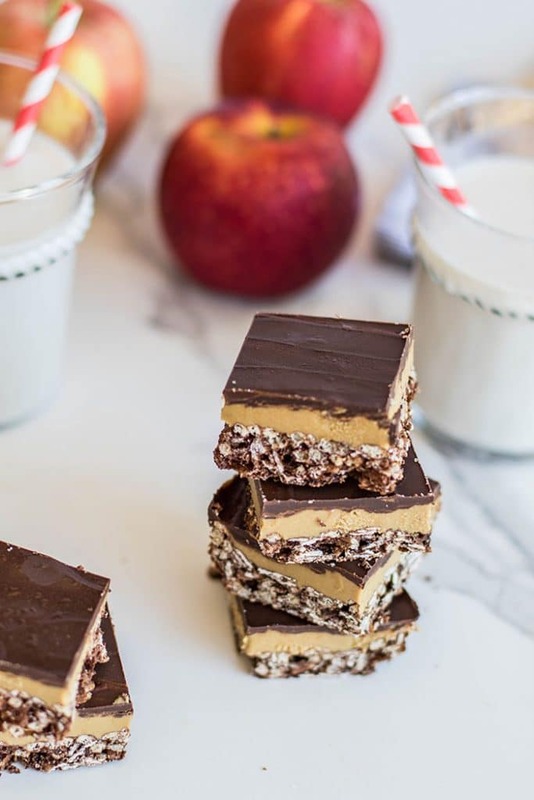 A crispy chocolate granola bar layer is covered in creamy sunflower butter, and topped with a layer of dark chocolate, for an allergy friendly, low sugar treat everyone will love! These make the perfect after school snack. Preheat the oven to 350 degrees F. Line an 8x8 baking pan with parchment or baking paper. In a bowl, mix together the oats, brown rice crisp, oat flour (this can be processed from whole oats in a blender, or store bought oat flour - i've tried both and it doesn't matter), cocoa power and sea salt. In a microwave-safe bowl, add coconut oil and date syrup (or honey). Microwave the ingredients for 20-30 seconds until warmed enough to easily mix the two together, but not hot. (longer if your coconut oil needs to be melted from solid). Mix the liquids into the dry ingredients, and mix well. Add the mixture to the prepared pan, and either press down evenly with wet hands or by using a pastry roller (see link below recipe for details). Bake cookie layer for 12-14 minutes, then allow to cool, and then refrigerate until very cool. To make the sunflower layer, mix all ingredients together in a bowl. If the sunflower butter is dry, you might need less coconut flour. When you first add the coconut flour, it won't make a big difference, but after sitting for 5 or 10 minutes, the mixture will thicken considerably. Layer the thickened sunflower butter over the cookie layer. Melt dark chocolate chips, and stir in sunflower butter. Cover the bars with the chocolate mixture in an even layer. Refrigerate to set before cutting the bars. Store bars wrapped tightly (or in an air tight container) in the refrigerator or at a cool room temperature for up to a week, or longer in the freezer. 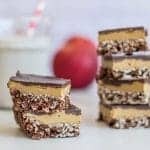 It's possible that these can be made with peanut or almond butters. The amount of sweetener or coconut flour might need to be adjusted. If you try it, let me know how it works! I've been wanting to make these with almond butter. This handy pastry roller is less than $5, and is used weekly in my kitchen. It’s great for smoothing the tops of cookie bars, granola bars, and gluten free crusts. These Look yummy. Can't wait to try. I am pretty sure you've tried one or two! Yummy! I've never used sunflower butter before but I'm definitely going to try now! Sunflower butter is my fav :) I'm allergic to peanuts, but people tell me sunflower butter is the closest nut butter to peanut. Wow! Those sounds so healthy and look so delicious. Pinning and thanks! Thanks Ginny-- and vegan, too! They sound delicious, I love dates and I bet the syrup tastes amazing. They are Brian :) I use date syrup in place of honey and maple syrup now-- it's a bit less sweet (which I like), and has that wonderful caramel flavor of dates. If Xander approves, there is no way I wouldn't. These look delicious! Well, I hate to break it to you, but Xander approves of everything coated in chocolate! At least he will eat the really dark stuff :) I don't mind if he has a bit every day. I don't even have children but I STILL want these bars as their afternoon snack. OK, that didn't make a lot of sense. The point is, I want those dang bars, HA! That's so nice to think about her Deanne! Peanut allergies are tough for kids :( They get excluded from a lot of treats at events. These bars are just the perfect kind of treat, Michelle! Can I use some other kind of butter instead of sunflower?